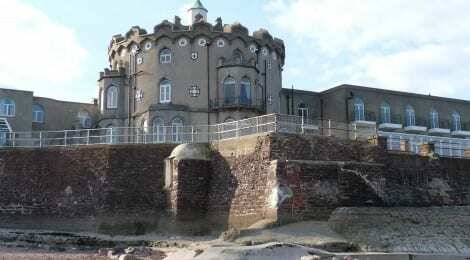 The eccentric building Redcliffe Towers, built on the edge of a cliff in Devon, is now a well-known landmark in the town of Paignton. It was constructed by Colonel Robert Smith in 1852-64 after his retirement from the East India Company (EIC) and a sojourn in Italy where he married a French heiress. Smith, an engineer and artist, was not a member of the landed gentry, however, he used his talents to rise through the ranks of the Bengal Army in India, from Cadet to Colonel. Smith left the Company with just an army pension, and it is likely he would have been unable to build Redcliffe Towers without the gain of a considerable inheritance upon the death of his wife. This case study records Robert Smith’s journey to India, to Europe and his final days spent in Devon, where he constructed his fairytale fortress, Redcliffe Towers. In doing so it contributes to the East India Company at Home project by demonstrating the ways in which EIC officials’ engagements with the subcontinent through practices such as drafting, building, painting and drawing, distinctly shaped the British homes they built on their return. To read Diane James’s case study in full, click here.